Pamela Messenger is general manager of Friends of Post Office Square. In the parlance of Post Office Square, there’s the Park Above and the Park Below. The strategically placed office of Pam Messenger looks down on both. 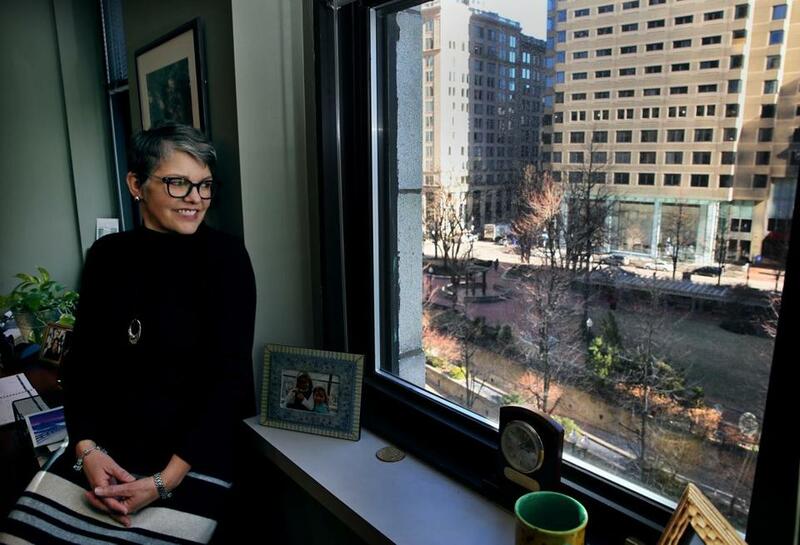 She’s the beneficent steward of the triangular block that sits in the heart of Boston’s Financial District. 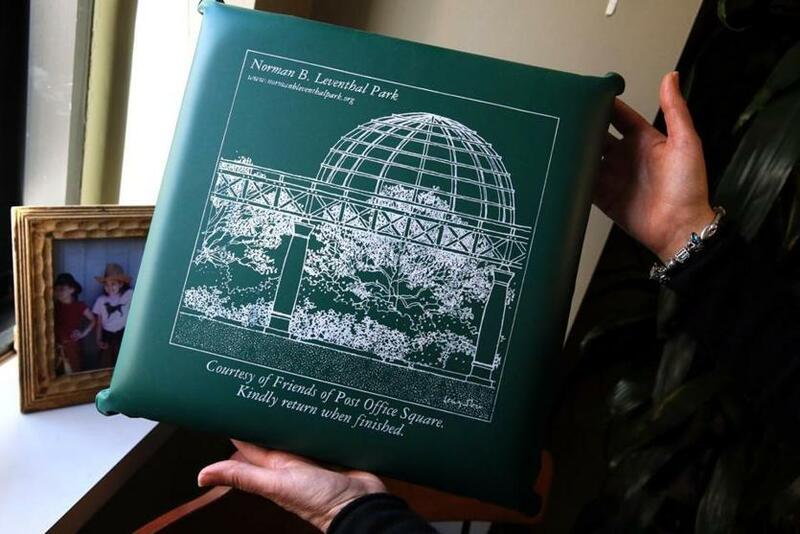 Messenger, general manager of Friends of Post Office Square, can gaze out her Congress Street window at the Park Above — the 1.7-acre Norman B. Leventhal Park — and scribble in her diary when the first buds pop on the stately trees that are on loan from Arnold Arboretum. “I know when the trees start budding and the leaves start falling,” Messenger says. She can also pick up the two-way radio perched on her desk and alert attendants stationed in the Park Below — the 1,400-space Garage at Post Office Square — if she spots unruly protesters, vendors hawking their wares, or vagrants showering in the park’s sculptural fountain. The park is meticulously maintained. Its trees are trimmed, its lawn tended, its plantings pruned, the bird droppings washed daily from the brick walkways. 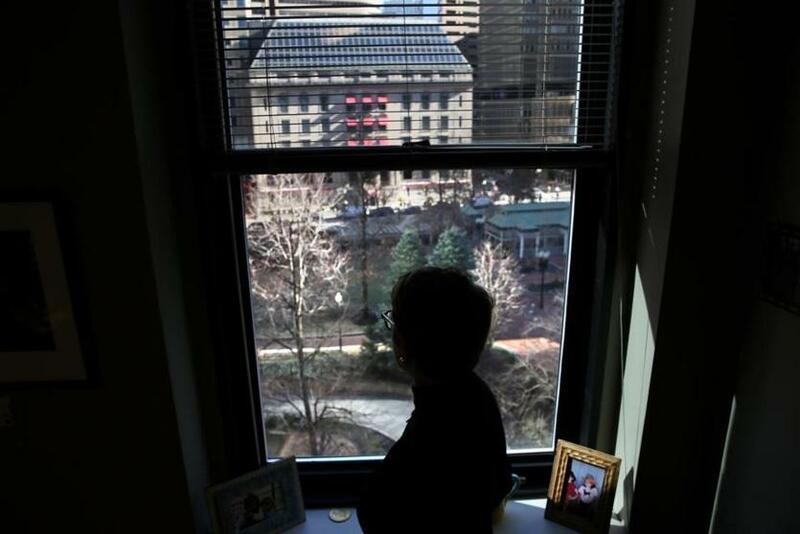 Messenger, who took the reins at Friends of Post Office Square in 2007, was a paralegal at the Palmer & Dodge law firm, which represented the abutting property owners, who formed the civic organization in 1983. They bought the city-owned land in 1987, and the following year they demolished an above-ground parking structure that was widely considered an eyesore. “There wasn’t a tree or a blade of grass on that lot for 37 years,” she says. 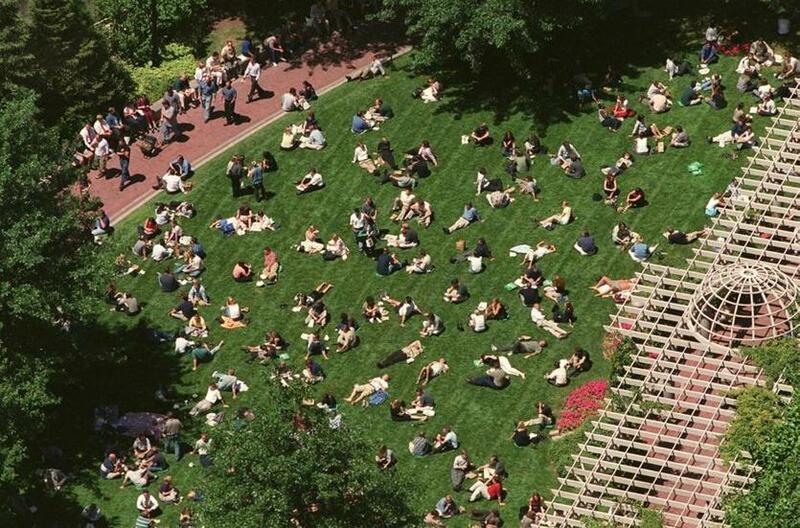 In 1990, they opened the new underground garage — complete with amenities ranging from auto detailing to a full-service flower shop — that would serve as the physical and financial foundation of the public green space above. The park, opened in 1992, has been called a downtown jewel. It features a vine-draped garden trellis, a lawn that hosts music and fitness classes in warmer months, and the Sips cafe, housed in a gazebo on the park’s edge. Friends of Post Office Square, under Messenger’s leadership, has moved into a new era. It’s refinanced its debt on the garage and boosted its Web presence, along with its commitment to renewable energy. It’s joined with Boston Medical Center and the Massachusetts Institute of Technology to buy solar energy from Summit Farms, a solar farm in North Carolina. 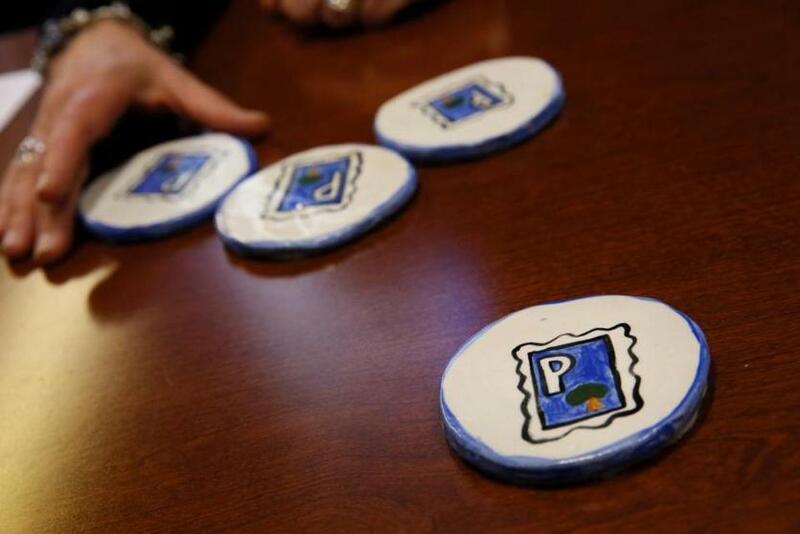 ■ Ceramic coasters painted with the postage-stamp-style Post Office Square logo sit on her desk. They were a gift from her daughter Olivia, now a graduate student studying landscape architecture. Ceramic coasters in Messenger’s office. ■ Hanging on the wall is a framed photo of the park by the local photographer Peter Vanderwarker. 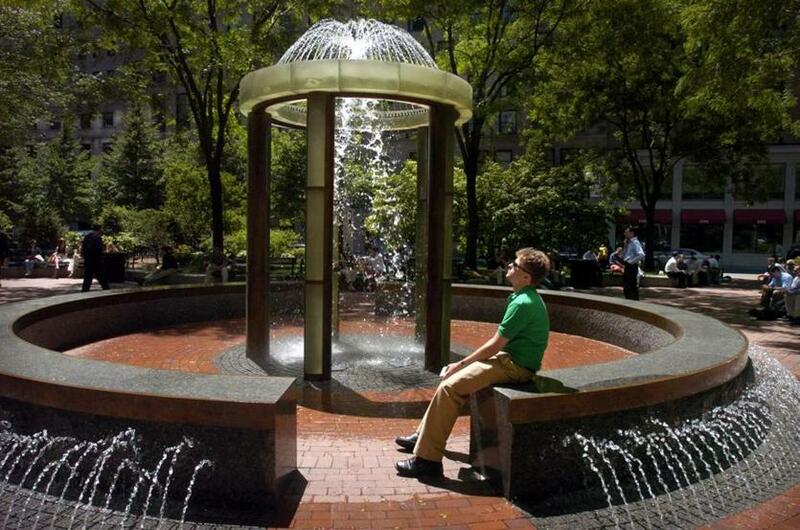 It captures the fountain surrounded by a ring of honey locust trees. 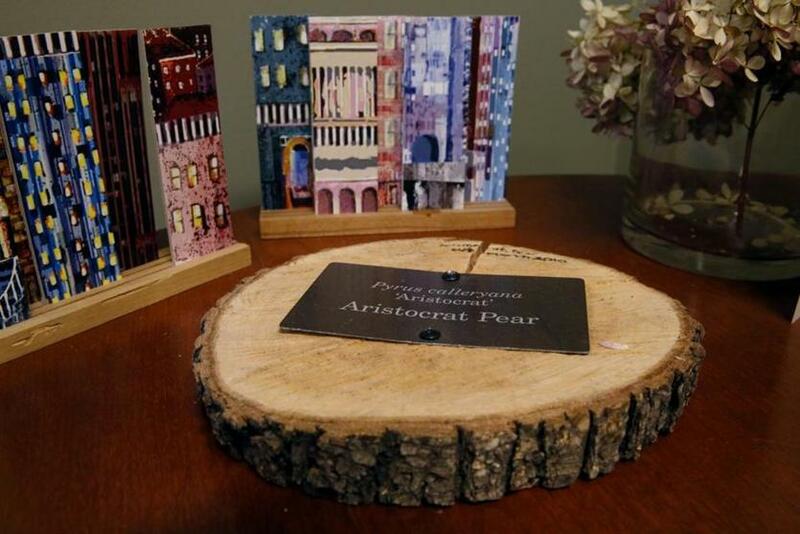 ■ A tree ring on display has a small plaque identifying it as an Aristocrat pear. It’s one of the “tombstones of the park,” Messenger says, a reference to original trees that didn’t make it. Eight pear trees were removed and replaced by Autumn Gold ginkgo bilobas. It’s all part of the ongoing landscaping work that takes place mostly on weekends, when fewer people use the park. A tree ring from one of eight diseased trees in the park that were replaced in 2010. ■ On a glass writing board, there’s a list of projects Messenger is working on this year. Among them: building a deck behind Sips cafe at the corner of Franklin and Congress streets, so the restaurant can serve beer and wine to commuters leaving work, starting later this year. “This is a big project this year,” Messenger says. Messenger watched the park from her office. can be reached at robert.weisman@globe.com. Follow him on Twitter @GlobeRobW.